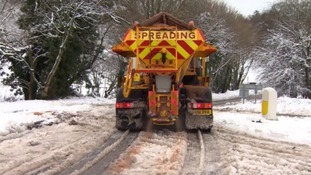 Somerset County Council has announced they're no longer planning on gritting 180 miles this winter to save money. They're proposing to salt 720 miles (17%) of the total road network instead of the 900 miles (21%) they have covered in previous years. The council's shared this map showing which routes will be covered in grit as a precaution when temperatures drop below 1C. Last winter, gritters travelled nearly 74,000 miles and used more than 10,000 tonnes of salt. The county council estimates it can save £120,000 by cutting these routes. We have to live within our means with greatly reduced funding and that means we’ve had to make some very difficult decisions in order to balance our budget. The one affecting our winter service was certainly one of the toughest. We’d rather not be in this position but we have had to look closely at all spending to see where savings can be found. We also want to make it clear that our established emergency plans for times of snow, such as during last year’s Beast from the East, are not affected by these changes. We’ll continue to work alongside the emergency services to maintain access to our communities.